Add a touch of tropical island living to your home with our unique handcrafted Hawaiian quilts. 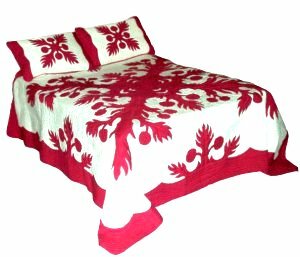 First introduced to Hawaii in 1820 by visiting missionaries the Hawaiians created their own unique style of quilting influenced by their rich culture and traditions. Intricate and beautiful designs such as the "Breadfruit" or 'Ulu reflect the nature that surrounded their everyday life. A special symbol of love these quilts were most often given as gifts on great occasions such as a birth of a child or a wedding. King $249.99 112" x 106"
Queen $219.99 102" x 100"
Twin $179.99 95" x 74"
Ready to Order? Select a Size & Color from the pull down menu.